Looks about the same size as the Mini/Mini2 , looks water resistant, use two (like Mini 2) for stereo. It looks very similar to Mini 2, wonder what is different? Mini 2 audio Output 1X 6W. Vs.
Motion Q audio Output 2X 8W. I guess they found the Mini 2 shaking a bit distortion at the higher wattage so changed it, Mini has sound out the top, button to sides, this is buttons on top, so what i expect is you'd find the Mini 2 sending noise up, reflecting off roof and then down, vs Motion Q more like the Nebula Capsule of sound projecting the side. That might make the higher frequencies crisper and bass less so as the reflections modify. Some of those difference make sense, others do not. 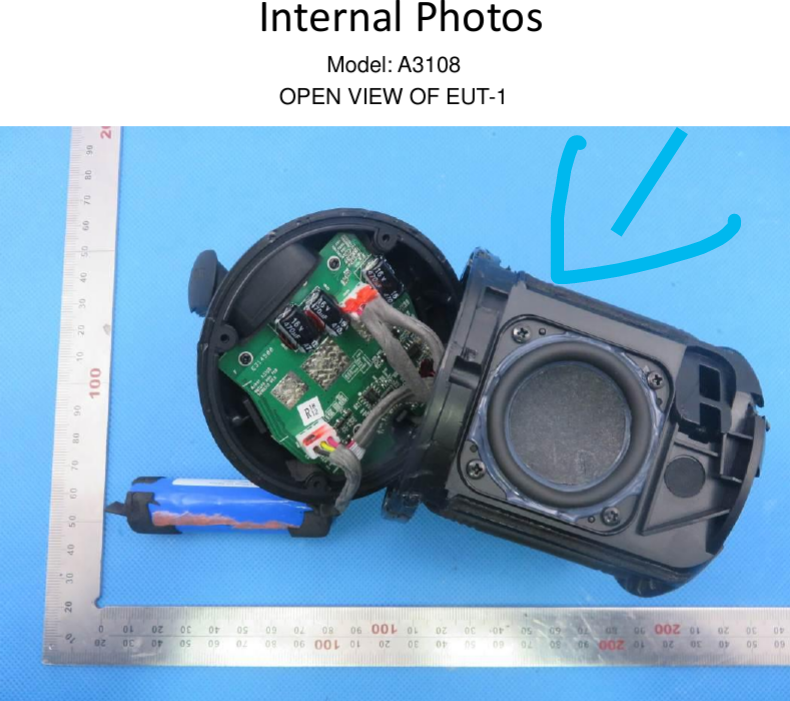 So the battery life infers you're actually looking inside the Motion Q is two physical speakers (stereo?) pointing in say different left/right directions so the Motion Q total 16W output? So if you had two of them say one is left channel the other right channel? How would it know? I would say on the other side is a second speaker..
@nigelhealy That's a good question. To me the most important difference that I can see is the size and weight. Also seems like they are really innovating with some of these names! I guess we have to wait for more info, but that is fine given it is at the FCC phase. It probably has to be mono but combined 4 speakers for spectrum, so one virtual mono across 4 speakers. No other way makes any sense. To make stereo you would need an app to say which is left vs right or...? This looks more premium than the mini 2 the texture of the material covered outside reminds me the HomePod. Might be too large to travel with 2 for stereo, I would try a cable with L+R, not really positive if these jacks will work with a mono plug.or not. I would much rather have the speaker facing me, better highs. I will wait on the Mini 2 for now. Two waterproof Nano to make stereo would be cool, backpacking with one each outside pocket. Recharge them off solar. The Anker soundcore motion Q is truly an amazing speaker. I like to play a lot of Rap and Rock and this thing really has some good bass. One thing I really enjoy about this little speaker is the fact that it has IPX7 waterproof protection. I have used it repeatedly as a shower speaker without any problems. The dimensions of the speaker are 4 1/4 inches tall by 3 1/2 inch wide. One really cool aspect of this speaker is that you can add integrate 2 speakers to make a wireless stereo sound. That coupled with the 360 degree directional sound makes it easy to set it and forget it. Having a speaker this small that packs this kind of sound output is truly impressive. If you are in any doubt about getting one of these, wait no longer as you will not be disappointed. looks like a good size for travel and decent wattage i wouldnt mind picking a few up. $50. Just seems steep. I'm used to a $20 type Anker sound product. But I'm sure if you wait it will drop. I'll be reviewing the Motion Q within a week or two. Really looking forward to it since my only other Bluetooth speaker to compare it with is the Soundcore Sport. Quite decent for what it is but lacking in the "punchiness" department. It will be interesting to see how the 8 watt x 2 drivers of the Motion Q compares to the Sport's 3 watt x 1, seeing that the current price difference between the two at Amazon is only $10. @nigelhealy - does this comparison with SoundCore Sport change the way you view the pricing?